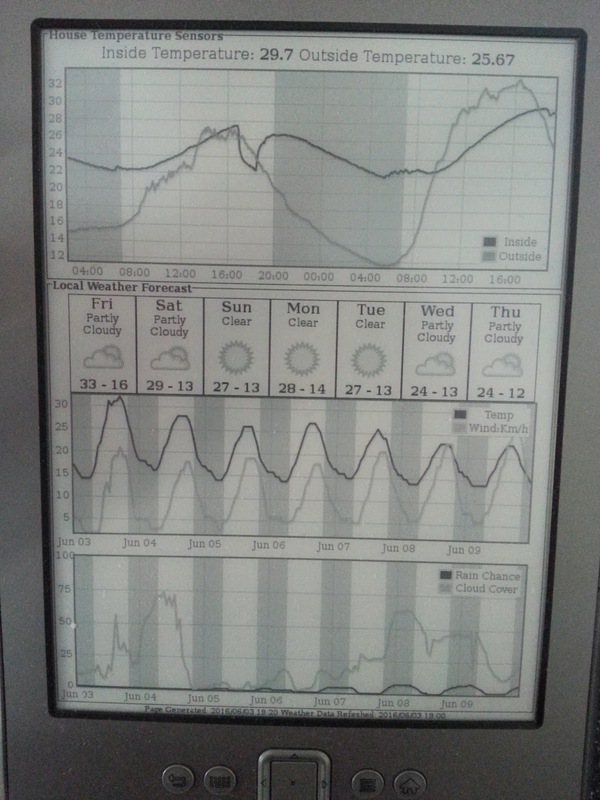 Turning old kindles into internet data weather displays. 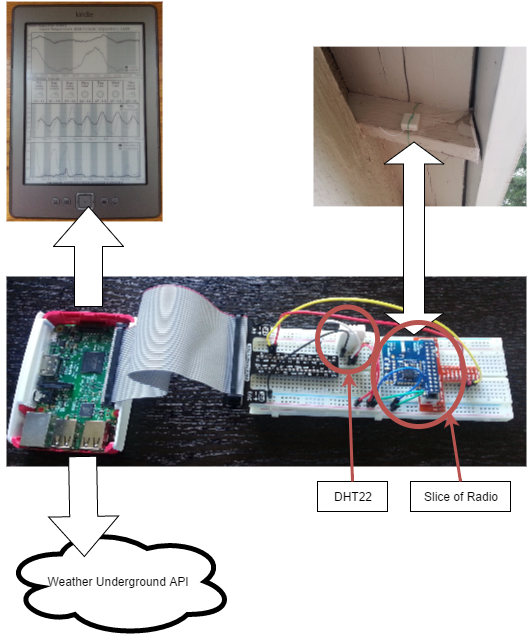 Using RF temperature sensors on a Raspberry Pi and displaying the data on a Pi served web page or simple LCD display. Combining these two projects seemed like a great project idea to learn about the Pi and electronics. I haven't seen this particular combination published on the web yet. Outside temperature as measured by a remote RF temperature sensor. 'Local Weather Forecast' - API call to weatherunderground.com to show 7 day descriptive forecast and graphs of local temperature, wind, cloud cover, and rain chance. Full tutorials take a lot of time to write, plus it's no fun following cut and paste steps. The real fun of tinkering is reading stuff, trying stuff and adapting it to your own needs. So here are some basic tips and pointers for anyone interested. I got a version 3. There is a slight hack to get the Uart pins working the same way as the Pi2 as the slice of radio expects. This remote temperature sensor is good as it doesn't require any configuration over serial port (unlike xbee devices). The bad news is that you have to solder the components together yourself. Price is good, you can buy the receiver and sensor as part of one kit. Any local temperature sensor would work. I got a Adafruit DHT22 but lots of others would do the same thing. You could also buy another RF remote sensor and just use that indoors too. There's tons of tutorials and info and how to create databases and use insert and select statements. use 'detect_types=sqlite3.PARSE_DECLTYPES' in your sqlite3.connect command. This makes python convert the millisecond values directly into python datetime objects. install iceweasel on your pi (which is firefox) and add the addon SQLiteManager. Managing your DB just got a whole lot easier. The adafruit local sensor comes with its own library and examples. Create a cronjob for every 5 minutes to poll the sensor and insert it into the database. The Slice of Radio works differently in that a bash script needs to be running all the time to capture incoming serial messages. Again use the example code provided with it and modify it to insert the data into the DB. This website is a great resource for CGI scripts, SQLite and Apache. He also has a excellent full tutorial on reading temperature sensors and displaying this via a google charts webpage. I ended up using flot charts in my project as they have the shading capability which I use to denote night times. This site is a great tutorial on logging temperature sensors to a Pi database and then displaying this via a webpage using flot charts. Especially useful is his code to create shaded areas on the graph to denote weekends, I adapted this code to denote nightime areas on my graphs. The kindle needs a small PNG file to display, it can't show a webpage. pngcrush will compress the file to a size agreeable with the kindle. This site will give you all you need to know about hacking the kindle. Install USBnet - this allows you to access the kindle over putty. Your read about some kindles not needing this but do it anyway, my kindle technically didn't need it but I had problems running cron without connecting via usbnet. Some tutorials out there setup much more (e.g. functionality for enabling/disabling the cron job) but I didn't bother with that. 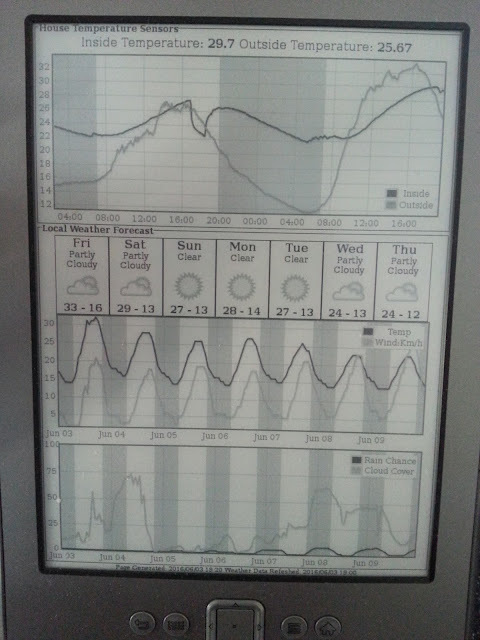 This site is one of the first internet resources on create a kindle weather display using internet forecast data. I used his display-weather.sh bash script. This is the file that is executed by the cron job on the kindle. The commands fetches the PNG file served from the Pi and display it on the kindle. Weather Underground provide free access to weather forecast via API calls and JSON responses.